This tutorial demonstrates Meep's frequency-domain solver which is used to compute the fields produced in a geometry in response to a continuous-wave (CW) source. For details on how this feature works, see Section 5.3 ("Frequency-domain solver") of Computer Physics Communications, Vol. 181, pp. 687-702, 2010. This example involves using the frequency-domain solver to compute the fields of a ring resonator which has been described in Tutorial/Basics. We will verify that the error in the computed fields decreases monotonically with decreasing tolerance of the iterative solver. Usage of the frequency-domain solver involves only two changes to the original simulation: (1) replace the Gaussian-pulse source with a continuous source, and (2) turn on complex fields since, by default, real fields are used. Everything else remains unchanged. Since the frequency-domain solver uses an iterative method, there are a couple of things we can do to improve its convergence: (1) use a non-zero smoothing width for the CW source (default is 0) to reduce the high-frequency oscillations produced by its abrupt turn on (which have slow group velocities and are absorbed poorly by PML), and (2) increase the parameter of the BiCGSTAB-L iterative solver from the default of 2 to 10. We will compute the fundamental mode at five different tolerance values chosen on a logarithmic scale: 1e-8, 1e-9, 1e-10, 1e-11, 1e-12. We will then plot the L2 norm of the error in the fields (relative to the results at a tolerance of 1e-12) as a function of the tolerance. The simulation script is in examples/solve-cw.ctl. The results are shown in the figure below. The field profile is generated using h5utils: h5topng -o ring_field_profile.png -vZc bluered -C solve-cw-eps-000000.00.h5 solve-cw-ez-real-000000.00.h5. 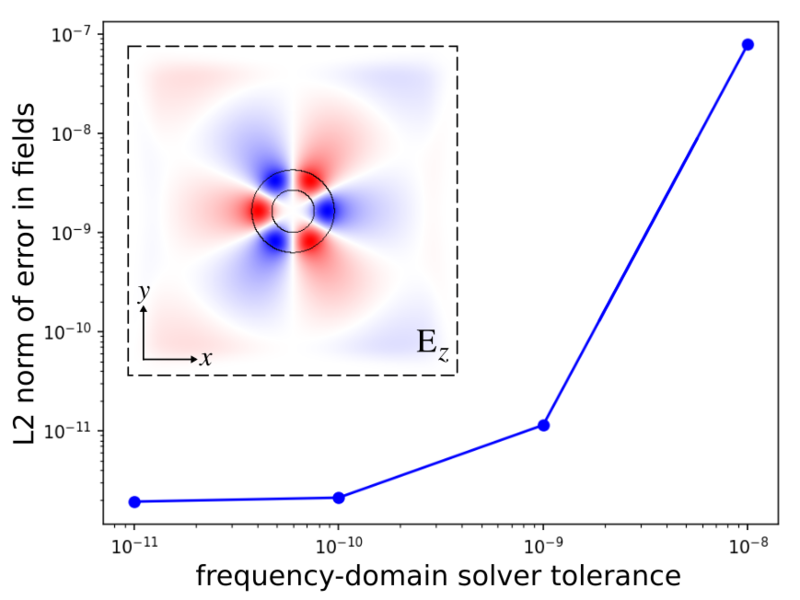 The error in the fields decreases monotonically with decreasing tolerance of the frequency-domain solver. The error is converging to an asymptotic limit of 1e-12 which is set by the lowest tolerance. The inset shows the real part of the scalar Ez field, computed using a tolerance of 1e-12, superimposed on the ring-resonator geometry. Note the three-fold mirror symmetry of the field pattern (fundamental mode) and the faint presence of the point source.